This Accessible Entrance sign can be used to direct persons with disabilities to accessible areas located towards the front of your building. This sign to guide people to accessible areas is available without an arrow, or with right, left, ahead or double arrows. 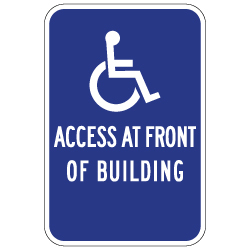 This sign is designed to direct persons with disabilities to designated wheelchair access points near your building when it is not easily visible from the entrance of a parking lot, parking garage, or any surrounding area near your property. DOUBLE the working life of your Accessible Guide Signs by adding 3M Protective Overlay Film (POF)! 3M’s high-tech POF protects sign faces against fading caused by the sun and harsh weather—and makes graffiti and sticker defacement damage easy to clear away without harsh abrasives.